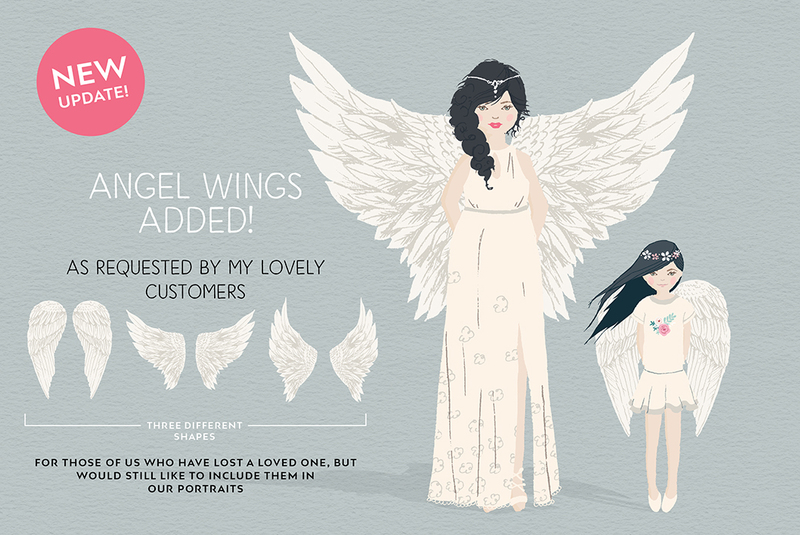 Create gorgeous illustrated personalised portraits in seconds! Just a quick note upfront, you need either Adobe Photoshop CS3-CC or Adobe Illustrator CS3-CC to use this kit. 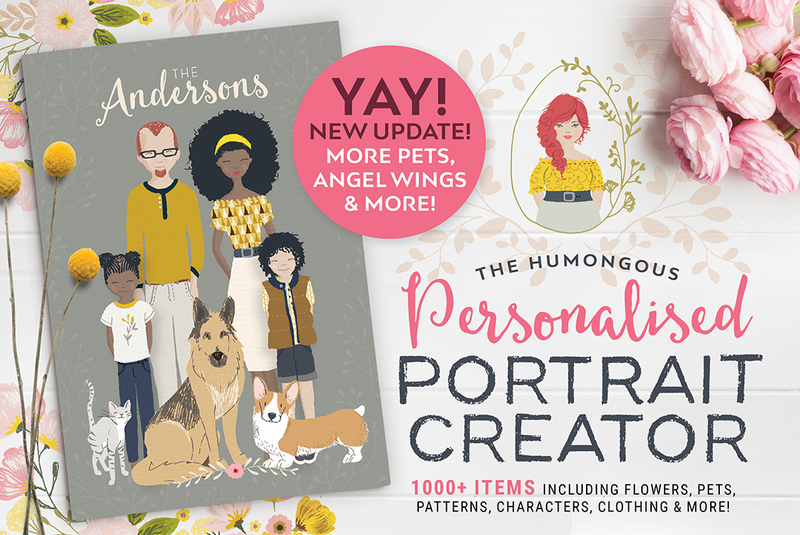 Introducing the Personalised Portrait Creator! 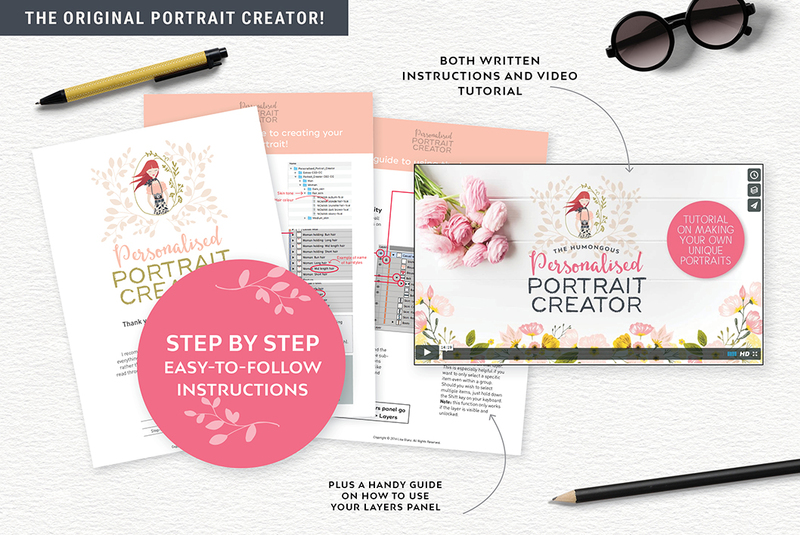 It’s super fun to use and with just a few clicks, you’ll be creating unique, hand drawn custom portraits that will wow your clients, impress your family and friends and even jazz-up your blog. Adding a personal touch to any project couldn’t be easier! Watch the short video below for a quick overview of the versatile kit! 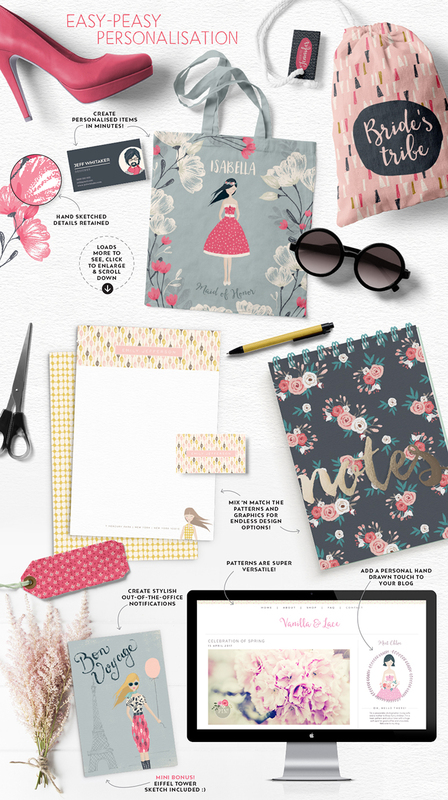 The Personalised Portrait Creator is a great design asset to have on hand to create beautiful personalised items! 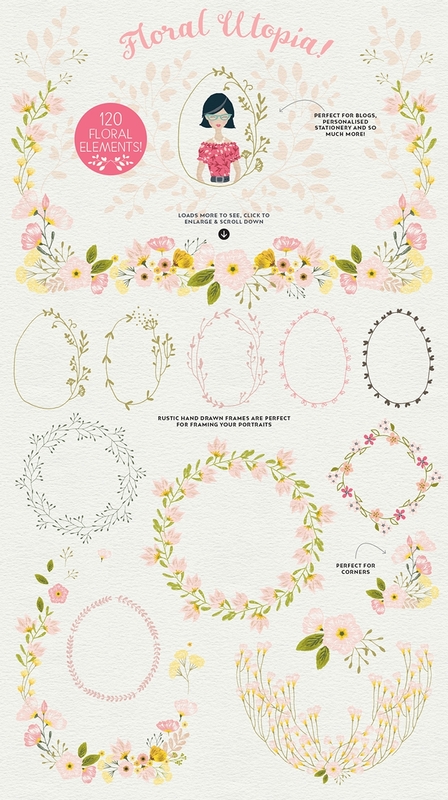 Perfect for personalised wedding stationery and one-of-a-kind bridesmaids gifts. Guests will love the extra personal touch to their wedding favours. Become a pro at designing personalised greeting cards or beautiful wall art, it’s so easy to use. And with the seasonal outfits included, you’ll be using this set all year round. 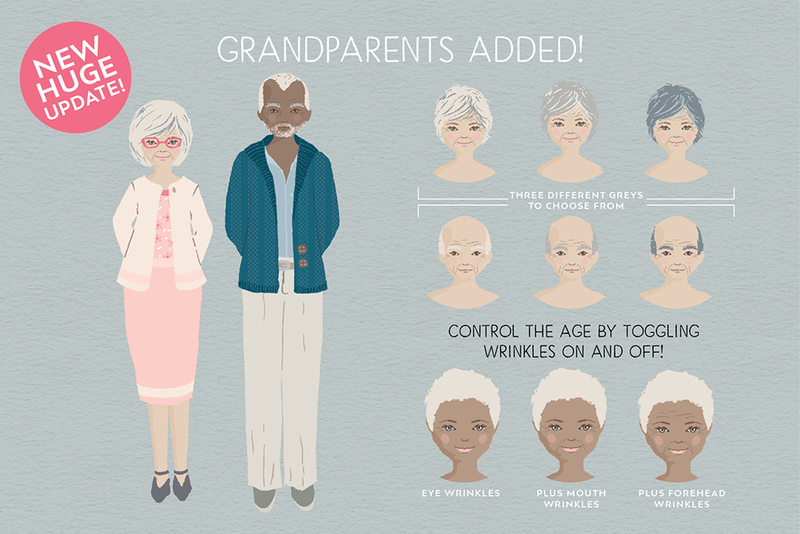 One of the many new features added, you can now add Gran and Grandpa to your projects! Creating extended family portraits couldn’t be easier. 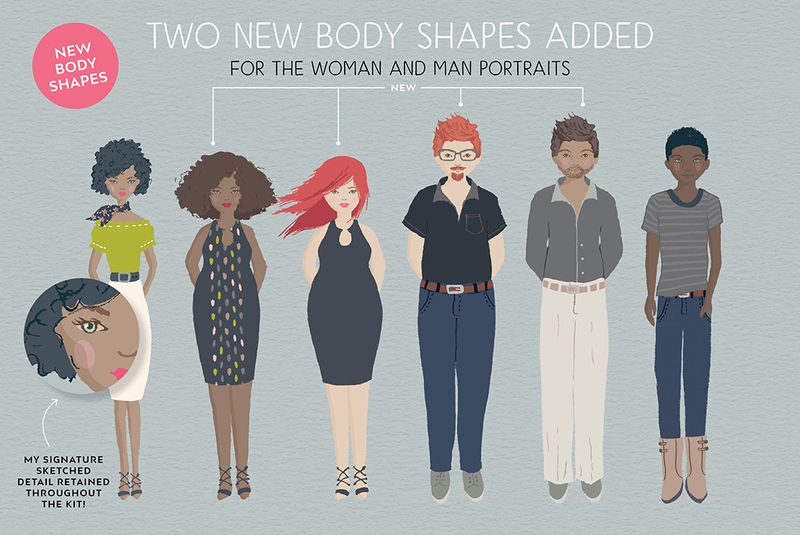 I’ve also included two additional body shapes for the Woman and Man portraits. Plus I’ve added eye colours you can customise. But it doesn't stop there, your special furry friends can be part of the action too! 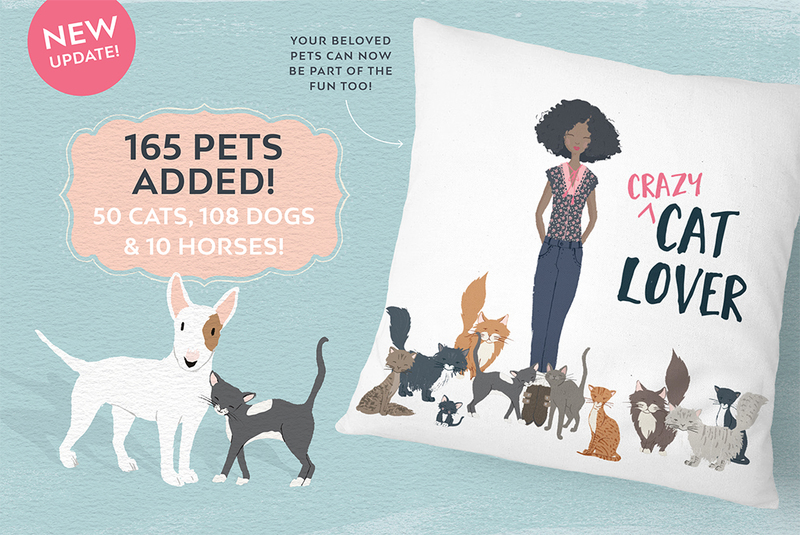 With over 155 cats and dogs, plus 10 horses, the kits fun-o-meter just went up a notch! I've made sure to retain all the details in my drawings so your work will look authentically hand crafted. 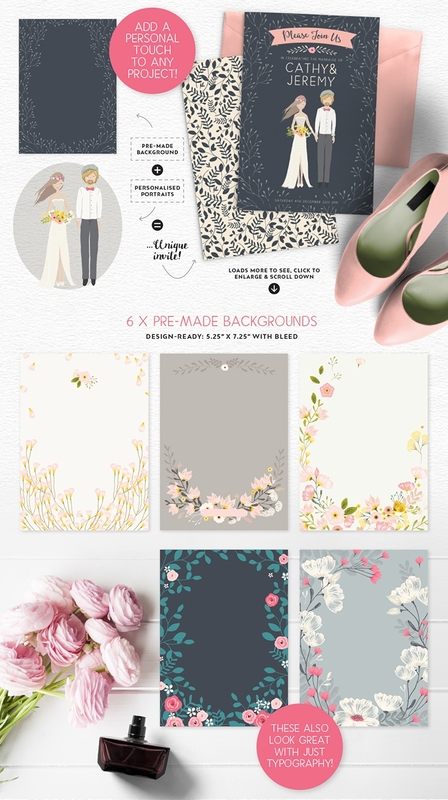 This set is perfect for holiday greetings, invitations, apparel, custom wall art, logos and so much more. 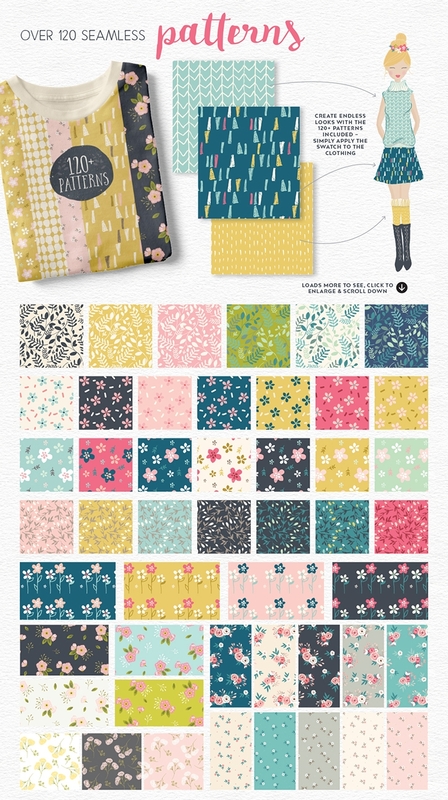 To keep the options endless, I’ve included over 155 patterns for the portrait outfits, 120 floral elements and some extra whimsical illustrations so you can design-up-a-storm and have fun doing it! And if you need some help getting started, you can view the tutorial here. 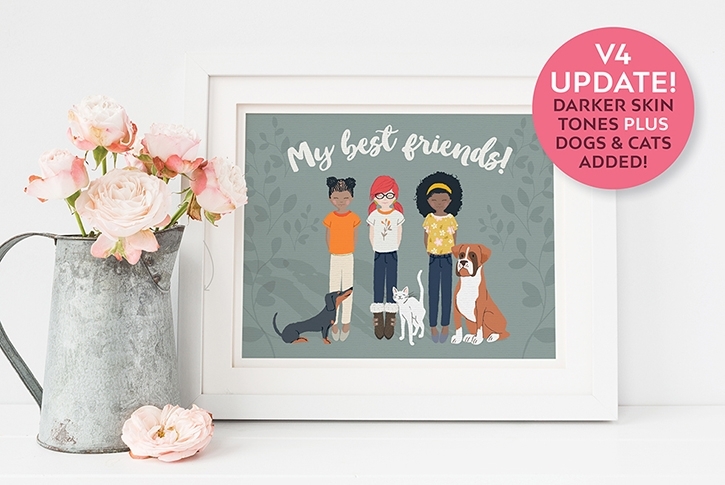 - This Personalised Portrait Creator is not an exact replica of the person you want to portray, but instead is a hand drawn illustration with whimsical features and outfits that will be a general likeness to the person. 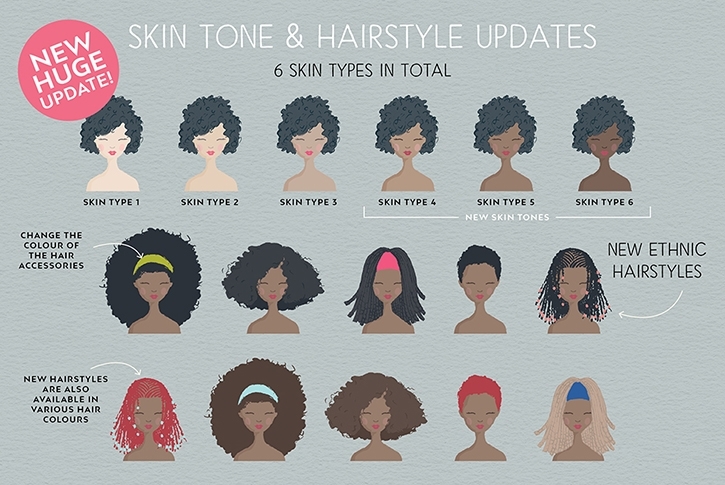 Hair colour, skin tone, hair style and accessories will contribute to creating the likeness of the person you want to portray. - This is not an app or plug-in, but rather meticulously pre-made documents that need to be opened in either required software mentioned above for customisation. - The Adobe Illustrator version will always be the recommended version for maximum flexibility and customisation. This has been on my wishlist since I first saw it a few months ago. So happy I finally got to purchase it. I want to know if you have any recommendations about making the adults look older. I want to make a Family portrait for my parents (with grandkids) and wanted to differentiate the grandparents from us adult kids. Hoping you have that add on in the future. Or would love to hear if you have any tips on making them look older. Thank you so much for your purchase, it’s much appreciated! 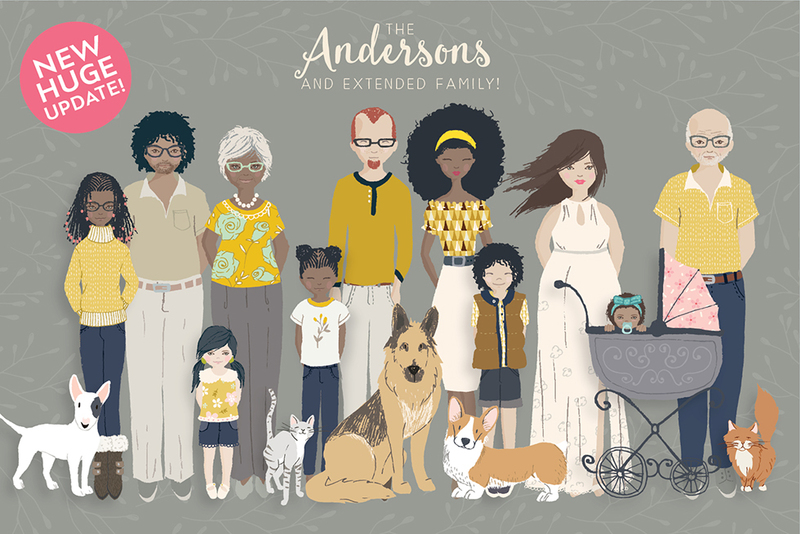 I am actually working on an update that will include grandparents plus a few other additions (once that’s done, I’ll be moving onto creating a fuller figure add-on 🙂 ). 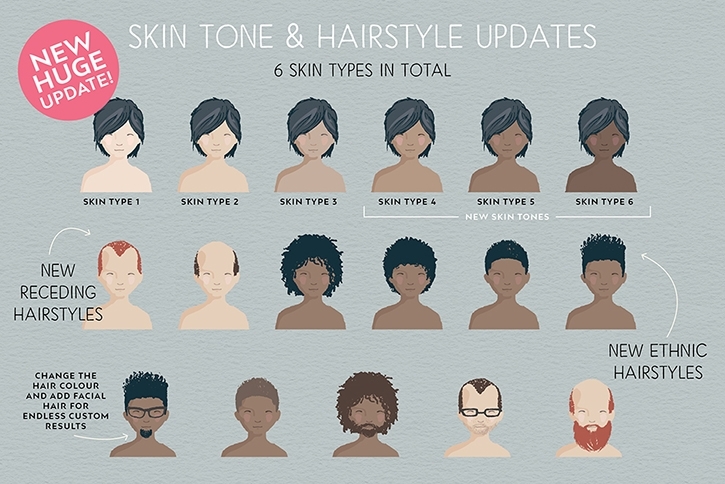 But in the meantime, you could use the balding hairstyle for the man and change the colour to grey. And for the woman, depending on the grand moms’ hair length, you could use the hairstyle with the bun and change the hair colour to grey, or the short cut style to grey. I am hoping to add wrinkles with the update, but still need to test that to see how it looks. Hope that helps in the meantime! So happy I’ve just bought it. It’s really good to see some various body types since I followed you on IG and expected to see this update real soon. You did! Thank you so much for your purchase! I’m so happy you managed to buy the updated set. It’s only live on my website shop at the moment so you’re one of the first to have it 🙂 Hope you have many hours of creative fun using the set! Lisa! 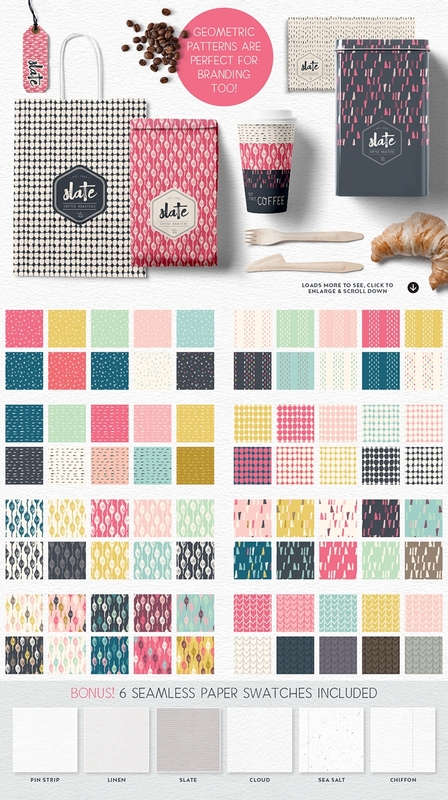 I bought this set from Creative market and I’m not finding the updated add-ons, is there a way to get those separately or am I just not seeing them in the main folder? 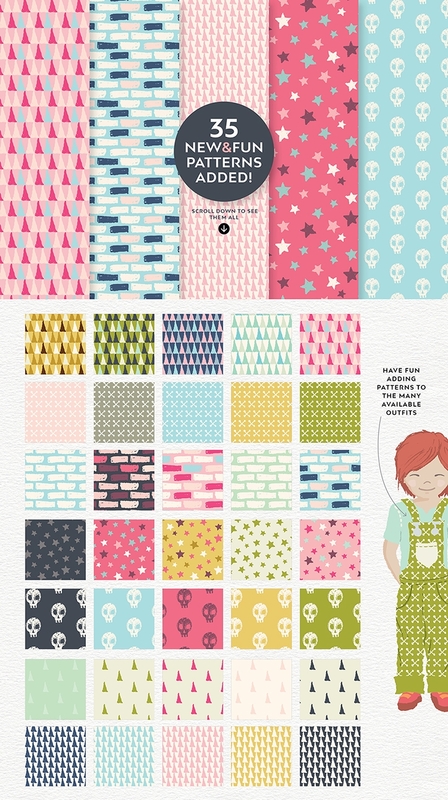 Hi Erin, Sorry about the confusion, but the update will only be live on Creative Market on Tuesday next week (19th). You should receive a notification when it’s up – just make sure you have your notifications turned on on your Creative Market account. Let me know if you have any other questions! Hey Lisa, I’m reading the last comment and wanted to make sure that I’m reading it correctly. 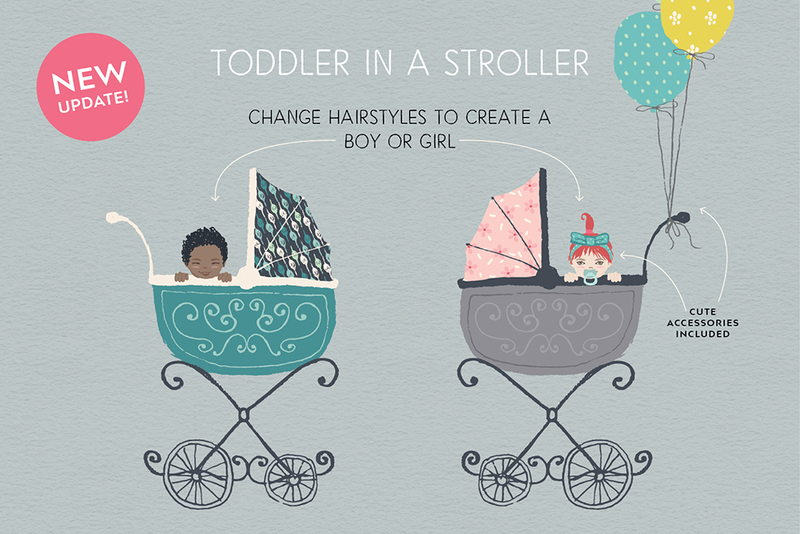 So the grandparents, different body shapes, summer maxi dresses and other dresses, the babies in the carriage, and the different eyes, mouth options will be available tomorrow on Creative Market? That’s where I bought mine from today. Hi Edith, So glad you like the creator! Thank you for your lovely comments 🙂 Hope you have many hours of fun with the new set! Lisa, this new update is amazing. 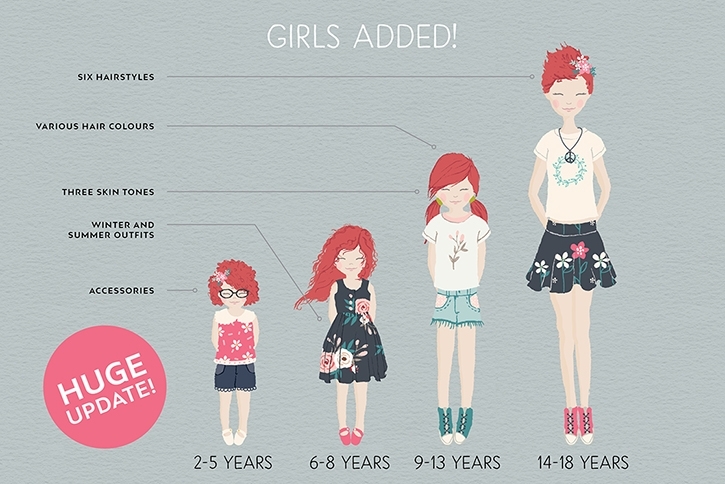 Not only the new body shapes, but the eyes, wedding dresses, babies etc! You’re a true artist and your work is a pure joy! Hi! Will this work with Adobe CS2? The portrait creator requires CS3 or newer, but you will more than likely be able to open up the Adobe Photoshop version of the kit in Adobe Photoshop CS2. You won’t unfortunately be able to open the Adobe Illustrator version in Adobe Illustrator CS2. Such beautiful work!! I am having so much fun using the portrait creator! Will you be adding different face shapes anytime soon? I am so in love with this entire set and concept. Quick question: in the latest release, are there options to have arms out to the side to hold hands? I don’t seem to see them. I love your design Lisa. Just a quick question, what is the difference between the standard and the extended? Does all the extra things you mentioned in the list in the standard kit? That makes me so happy that you are happy! I love your suggestions about the seasonal/holiday clothes. I do have them on my list and I hope to possibly add those in the future sometime. 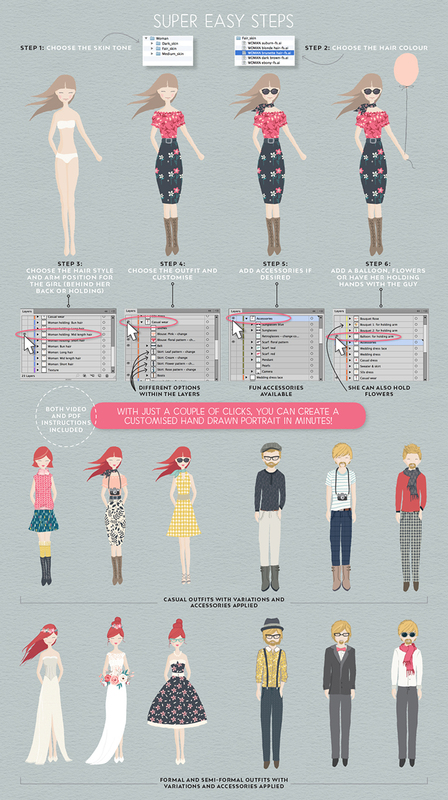 Enjoy creating your portraits! Hi Lisa, I’m a new fan of your work!! I just purchased a couple of sets last night, I am so excited to start playing with them!! Quick question for you, are there any resources that you recommend for printing? Either particular vendors, or for example Do your designs work best printed on photo paper or more of a press printed item, etc. I always prefer a matt uncoated paper, or a satin finish paper. It’s a personal preference because I think it looks more authentically illustrated on uncoated paper. 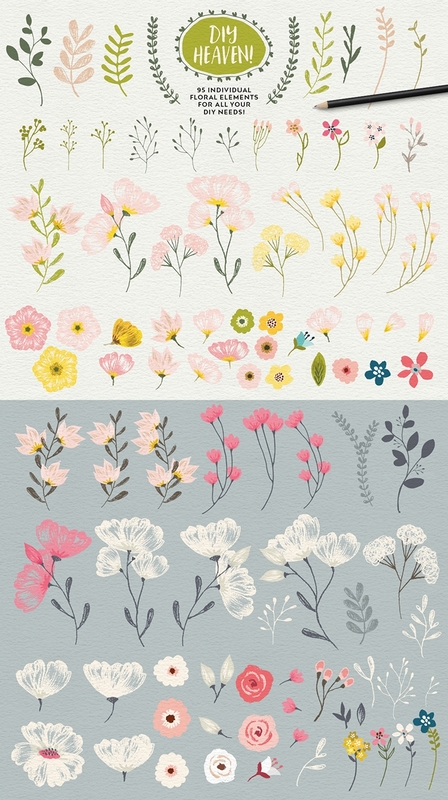 You can even choose an uncoated paper that has a watercolour paper/texture finish to it, this looks particularly lovely if you’re going for a rustic, hand crafted look. Lisa, I just discovered your wok today and it absolutely blew me away! I am on the verge of buying it, but I was just wondering is there any modest clothing for the lady? Just curious! Again, love your work. Hope you do more of this someday. So happy to hear you discovered my work and that you like it, I’m humbled, thank you. There are a few outfits that have long sleeve tops and jeans. But generally the outfits show arms and some show shoulders. The maxi dresses are long in length but also show arms and shoulders. I will definitely add your request to my list – but I do in general work on items with the most requests. If you have any other questions at all, please don’t hesitate to let me know. I really like your personal creator. I have one question about the packages because it is not quiet clear for me. It is not show difference between the packages when I click on the standard and extended. Can you let me know what is included in the standard package? Also, are there any rules or policy about how to use it? Hi Lisa! 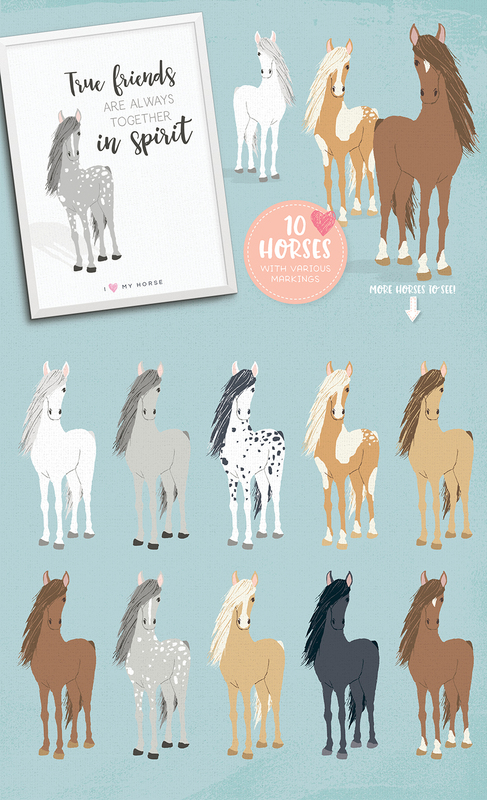 I am so excited to have purchased this–so fun!! Do you have a baseball style hat included?? Everyone in my life wears them but I don’t see one….I may just be missing it, I’m blind sometimes! LOL I’m in Photoshop CS5 if that matters. Some of the man hairstyles do have a peak cap included within the hair layer – you’ll find it under the hairstyle name as the top layer. It’s a little tricky to add it as an overall accessories due to the fact the cap won’t necessarily fit over some of the hairstyles, hence why only some have that option. I am however going to add a baseball cap “hairstyle” option in the next update. Hope that answers your question. the illustrations are beautiful! Will this work with adobe photoshop elements 2018? Hi Julie, I have been told that it does work in Elements 2018, but unfortunately I cannot guarantee that or offer full support because I don’t have that software to trouble shoot issues. This set works best in either Adobe Illustrator CS3+ or Adobe Photoshop CS3+. Hope that helps! Hi Lisa! I’m loving playing around with this and figuring it out. Is there a chance for some converse in the mens shoes? I’ve used layers and masking to make it work, but it’s missing some laces to do it. Ooops 🙂 Also, what are the chances of a any pitbull dogs, or german shepherds? Is it possible to change the colors of the dogs in photoshop? When I try it just gets rid of all the detail. I thought I could change the black lab to look like my brown lab/pit mix, and if there was a german shepherd maybe change the colors since he’s a yellow shepherd with black markings, rather than the typical black shepherd. I’m sure you’re swamped, but I would definitely love to see those when/if you run an update (if you haven’t made them already). So happy to hear you are loving the set so far! I do plan on adding more dogs to the next update. You can adjust colours in Adobe Photoshop using the hue and saturation tool or even the curves tool. You could also try using the selection tool or magic wand in Adobe Photoshop to select certain areas of colour and change that with the Hue and Saturation tool. Perhaps even try the brush tool to add or take away markings. Hi! Im a photographer and Im trying to figure out the selling of the family portraits. Can I only sell it if I pay for the $390 version? Or can I sell 500 of them on the $39 version? I love it! Its so adorable! Hi there, I just created a post that should answer your questions related to selling portrait prints to your clients. You can find it here. If you still have questions pop me an email. Hi Lisa! I’m excited about this purchase! Are upgrades that you come out with included in the price, or are they additional? Hi Lisa! I love this set so much, thank you for the amazing updates! 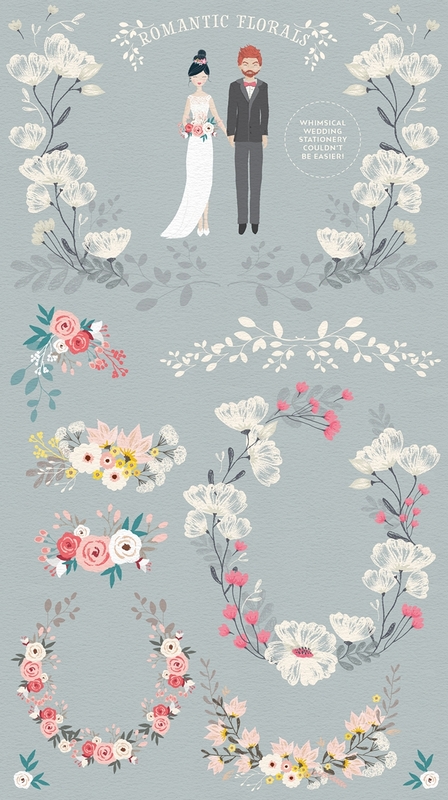 I was wondering if you would consider creating a wedding add on pack with more wedding dresses, bouquets, etc? Hi! I purchased this before Christmas and LOVE it! I love the new dogs and angel wings that have been added recently. is there a way to purchase just an upgrade? Thanks! Hi Irene, So happy to hear you love the set! All updates made to the main kit are free to existing customers, so no need to purchase the update. 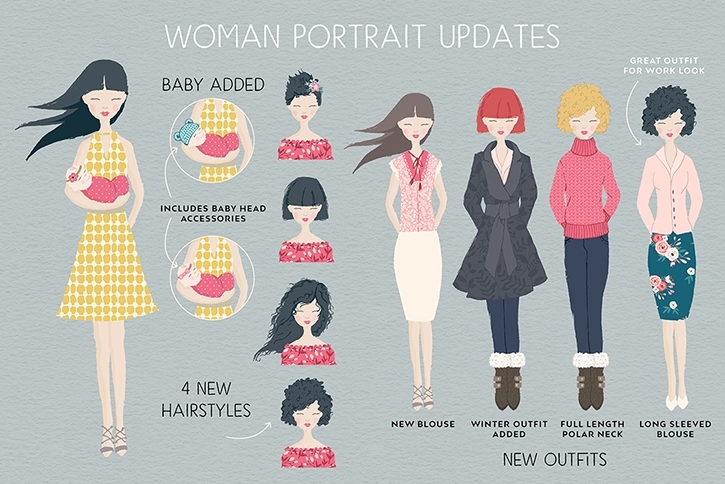 To access the latest update, log into your account on my website https://www.lisaglanz.com/my-account/ and locate the Portrait Creator in your Downloads area. From there simply re-download the product files again to get the most up-to-date files. One tiny addition request.. of the many many I am sure you get! Thank you for your suggestion! I’ve just added it to my growing list 🙂 I try and include the most requested items in the upcoming updates. Hope you’re enjoying creating your portraits. HI, just downloaded this creator – it’s is amazing I might just spend the whole day playing! Can I suggest some future ideas? How about more hat styles. Also activities. Likes sports wear, horseriding gear, cycling kit that sort of thing. Also how do we hear about updates? Thank you so much for your purchase, Robin. If you belong to my mailing list you’ll be notified each time a new update is available for download. I’ll also be creating add-ons like sports gear in the future 🙂 Hope you have many hours of fun creating your portraits! LOVE THIS! Any chance there will be a pet builder in the future? Either as an update or as its own thing. We have a mutt so while some of your bodies work, none of the coloring works. Could probably make it work if I could just turn on a different sock(paw) color or add additional texture of a different color to your existing bodies. Thanks! Hello Lisa! I am so loving this set! It is so easy and fun to work with. May I suggest adding a wheelchair and walker for our disabled friends? I have a three year old niece that uses a walker. I would love to see it added to your collection! Thank you! So happy to hear you are enjoying the set! Thank you so much for your feedback! I do have a wishlist that I add all suggestions to and a wheelchair options is definitely on the list. 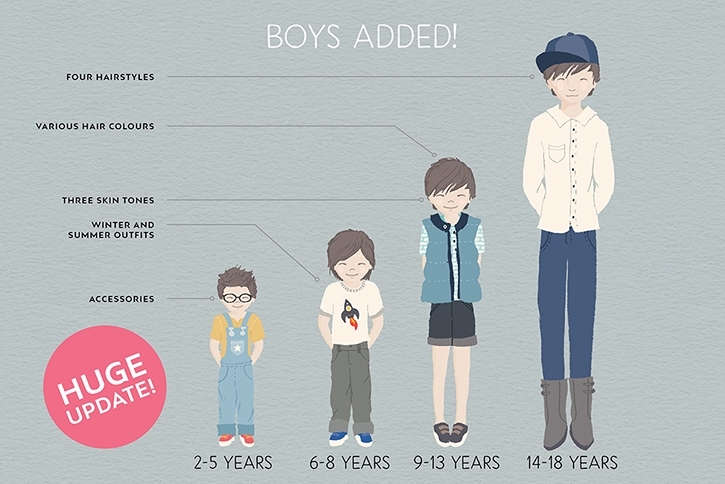 The biggest obstacle I face is time, I would need to recreate an entire new kit for all the age groups and genders etc. to accommodate the body position – the current kit took over a year to create so it’s a fairly time consuming exercise 🙂 But as mentioned, it is on my list and is something I would LOVE and hope to offer in the future. Thank you for your amazing work! It has been so fun and a really fantastic experience playing with it. I was wondering if it is possible to add the braids hairstyle for men, without the headband? Hi Angela! So happy to hear you are enjoying the set. I don’t have braids at his stage, but I’ve just added it to my list! It should be available in the next update. If you have any other questions at all, please don’t hesitate to let me know. I bought this back in December 2017 and just loved it! So fun playing around with it! I noticed there has been some updates to it….how do I go about getting the updates am I have to repurchase the entire set again or is there a way to just get the updates? So happy to hear you are enjoying the kit! No need to repurchase, all updates made to the kit are free to existing customers. To access the most recent files, just log into your account and re-download the zip file again which you’ll find under Orders. If you have any other questions at all, please don’t hesitate to let me know. 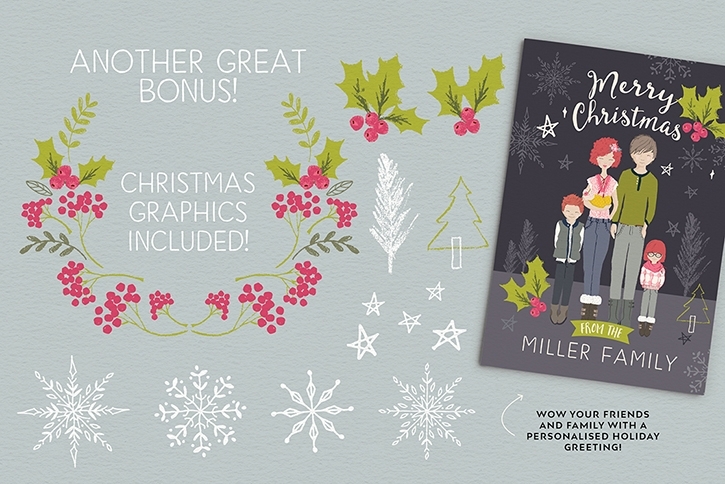 THANKS so much for the free christmas update of the personalised portrait creator! The preview looks great. Unfortunately both download links haven’t worked for me so far. But I keep trying and am looking forward to playing with the christmas items and rabbits. THANK YOU & Have a very merry christmas and an awesome and healthy 2019! Download was successful. Lovely update! THANKS! Yay! So happy to hear that! Thank you so much for letting me know. Hope you enjoy the Christmas hats!! I LOVE this product. I recently downloaded the update but I’m unable to find the rabbits or the new christmas things! So happy to hear you’re enjoying it Stephanie! 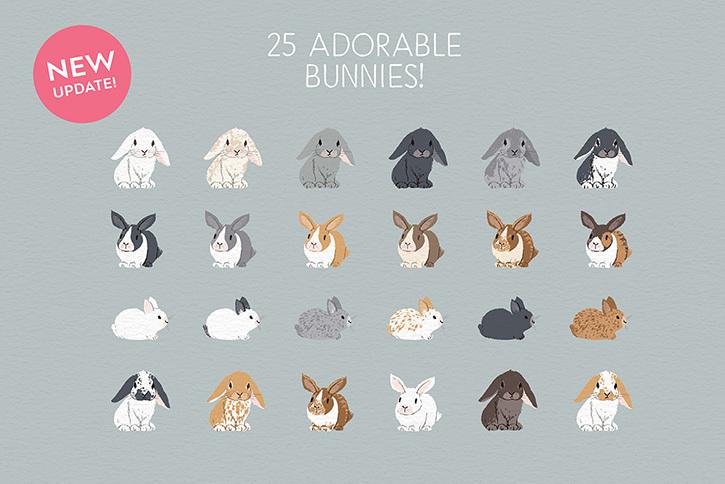 If you have the latest version of the files you’ll find the bunnies in the Extras > Pets folder and the Christmas hats in the Extras > Christmas Graphics folder. If you don’t see them, then definitely re-download the files to get the latest version. Hope that helps! Do you have a wedding creator as well that offers different variations of gowns and dresses for weddings? Thanks! I don’t unfortunately have more wedding dress options that aren’t already in the kit at the moment, but it’s definitely on my wishlist for possible future add-ons 🙂 If you have any other questions at all, please don’t hesitate to let me know. Thank you for your feedback and enquiry! I don’t have immediate plans to work on different poses as this would involve creating a new kit (phew!). I will however add your suggestions to my ever-growing list of requests – I try and include the most requested items in the upcoming updates. 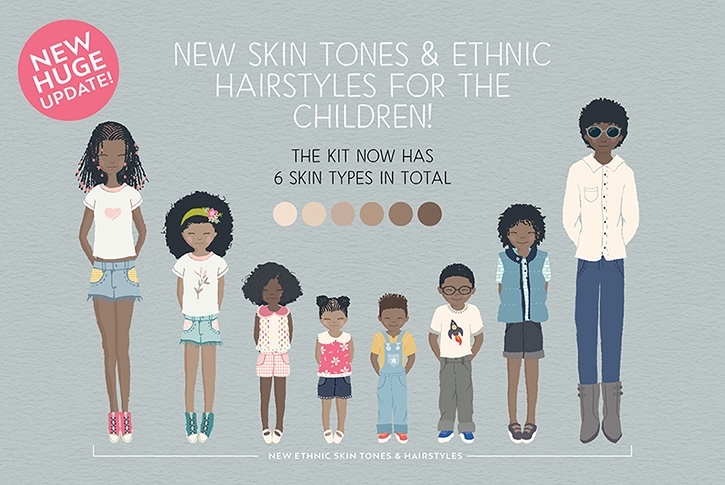 For any updates made directly to the kit, these are free to existing customers 🙂 I am also planning on creating add-ons that can be purchased separately like occupation specific outfits among others. When a new update comes out, to access the new files, all you need to do is re-download the zip file again from your account from the marketplace you purchased it on. Create gorgeous personalised portraits in seconds! 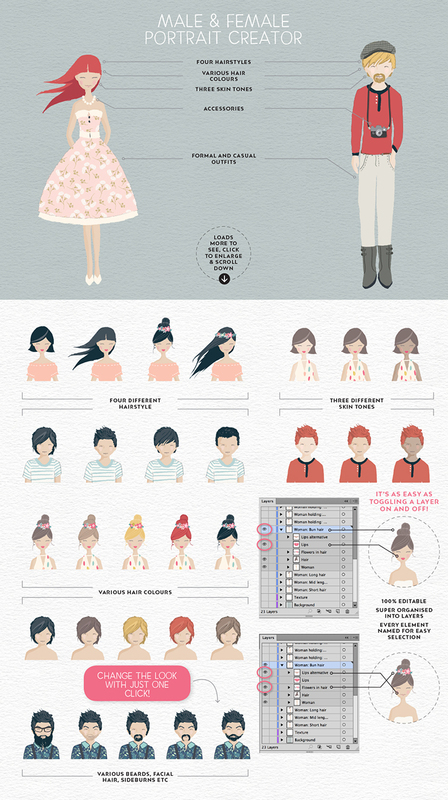 This Portrait Creator is available for both Adobe Photoshop (PSD) and Adobe Illustrator (AI). Due to the use of layers and their organisation, unfortunately I can't guarantee that it will work in any other software other than the Adobe software mentioned above. Vector files are available for Adobe Illustrator CS3 and newer. Raster files available for Adobe Photoshop CS3 and newer. The Creator is a PSD file. Patterns are 11" x 11" 300dpi JPEGs. All extras are 300dpi PNG files. A note of Photoshop Elements: The software requirements for this set is either Adobe Illustrator CS3+ or Adobe Photoshop CS3+. I have however been told by customers that the set works in Elements 2018 but I can't unfortunately confirm that or offer customers support for Elements due to me not having the software to trouble shoot issues customers may be experiencing or guide them on how to use the software. Thank you.